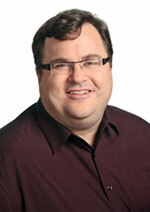 The Stevie® Awards today announced that Reid Hoffman, Executive Chairman of LinkedIn Corporation and a Partner at Greylock Partners, will be honored with its 2012 Difference Maker award at The 10th Annual American Business Awards new product and tech awards banquet on September 17 at the Julia Morgan Ballroom in San Francisco. Hoffman will be just the second recipient of this honorary Stevie Award, which will be presented in recognition of his role in shaping social networking and entrepreneurship in the U.S.A. DefJam Recordings founder and entertainment industry leader Russell Simmons received the ABA’s Difference Maker award in 2011. In 2003, Hoffman co-founded LinkedIn, the world’s largest professional networking service, in his living room. LinkedIn has more than 175 million members in 200 countries and territories around the world. He led LinkedIn through its first four years and to profitability as CEO and Chairman. Hoffman joined Greylock Partners in 2009 and currently serves on the boards of Airbnb, Edmodo, Mozilla (Firefox), Shopkick, Swipely, Wrapp, and Zynga and has co-led investments in Coupons.com, Groupon, and Viki. He also leads the Greylock Discovery Fund, which invests in seed stage entrepreneurs and companies. He believes strongly in the ability for entrepreneurship and technology to improve the world. Hoffman serves on the boards of Kiva.org, Endeavor.org, DoSomething.org, and StartupAmericaPartnership.org. He also co-authored the best-selling book The Startup of You: Adapt to the Future, Invest in Yourself, and Transform Your Career. Widely recognized as the premier business awards program in the U.S.A, The American Business Awards honor organizations and individuals in a wide variety of categories -- from management and public relations to technology, human resources, new products and more. The ABA’s September 17 banquet in San Francisco will feature the announcement of 2012 Stevie Award winners in categories for new products and services and achievements in technology industries. Awards in other categories were announced in New York on June 18. For more information about The American Business Awards or for press credentials to cover the September 17 ceremony, please contact Liz Dean at 703-547-8389 or by email at liz@thestevies.com.